Khlong Khao Daeng is suitable for cruising to admire the scenery and various kinds of animals in the mangrove forest ecology. 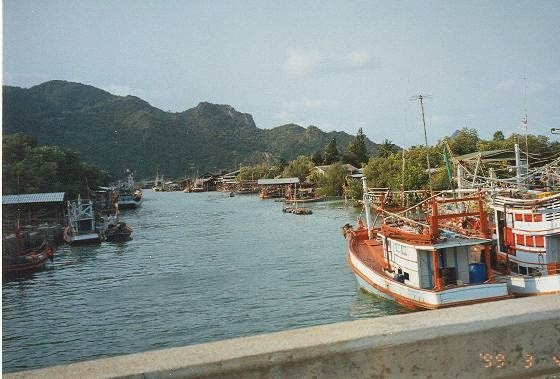 Tourists can rent a boat from Khao Daeng and Bang Pu villages and board at the pier in front of Wat Khao Daeng. The cruise will go along the canal for 3-4 kilometres and takes 1½ hours for a round trip. The appropriate period of cruising is from 4.00 to 5.00 p.m. because it is not too hot and the sunset can be admired as well.The four km canal trip along the Khlong Khao Daeng is a great way to spent an hour or so, or a great place to see birds early in the morning. The scenery is breathtaking and you may spot a monitor lizard out for a swim or some monkeys swinging through the branches. You can ask for someone to take you at the park headquarters or just go to the village and find someone Most fisherman do not speak english. Even you don't go to Hua Hin by train, you shouldn't give it a miss visiting the one of Thailand's most beautiful railway station. Hua Hin Railway Station built in the reign of King Rama VI. The station just located in town, not so far from central of the town and beach, you can walk to or if feel give up from the heat of sunny day, you can take taxi (motorbike and Samlor). 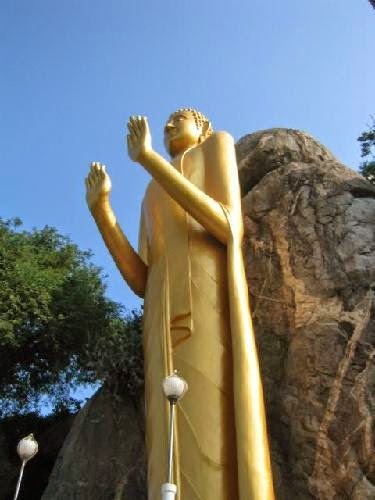 Approaching Khao Takiab hill from the beach, you can see an majestic 20 meter tall statue of the Lord Buddha towering on some rocks at the foot of the hill. Beware of the monkeys, they are not dangerous, but very curious to see if you have any food or drinks with you. After a few minutes, you will arrive in the monastery by the bay! Very pretty and beautiful scenery..You can view hundreds of monkies alike wanting to have a piece of your banana..If you like to take pics with them, you can they sure know how to pose to! Panee Butterfly Garden is the latest attraction in Thailand in Hua Hin. Set in the midst of an emerald green surrounding, this garden makes an ideal backdrop for colorful butterflies. As the name suggests, this garden houses hundreds of varieties of butterflies. 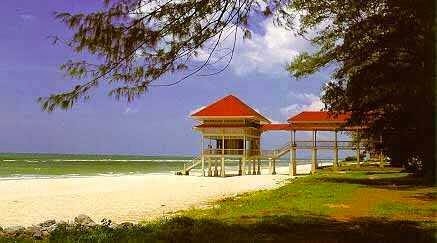 It is located at the Petchkasem Beach Road in Hua Hin. The butterfly garden offers a unique experience for nature lovers. Beautiful butterflies with different colors, shapes and patterns can be found here. The garden is dotted with a large number of flowers as well. Hence, together they make a perfect tranquil ambience. This spectacular garden faces the beachfront of Hua Hin. This temple is located about 13 km south of Hua Hin adjacent to a little sleepy fishing village. 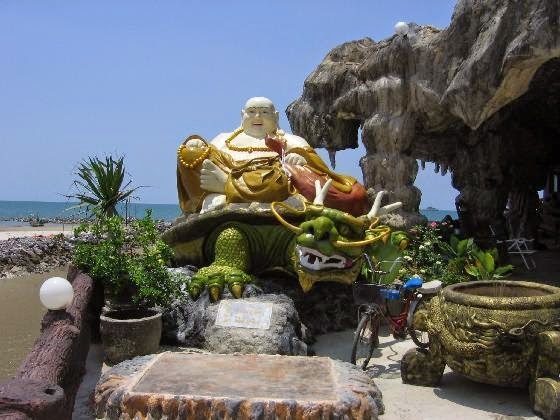 There are many beautiful sculptures, including a dragon-riding Buddha and a giant golden turtle, as well as great views of the sweeping Suan Son Beach. Follow the short path up the hill through several monk bungalos to find a huge sitting Buddha at the summit, majestically overlooking the temple below. The monks at this temple are particularly friendly and outgoing. This temple offers a wide variety of tasty refreshments for its visitors free of charge. But make a small donation; after all, it's for a good cause. This temple is definitely well worth a visit. This cascade is found on the south side of Kaeng Krachan National Park, some 60kms west of Hua Hin. The park is one of the largest in Thailand and sits right next to the Burmese (Myanmar) border. It is a beautiful spot to visit. You will pass through stunning countryside and hills on your drive there that will only take 1.5 hours or so. The waterfall has 16 steps, making it one of the highest in Thailand and those who make it to the top will be rewarded by superb views over Thailand and towards Burma. It should be noted, however, that progressing further than the third stage will be arduous and should only be attempted by those fit enough to do so. The third stage itself has a large, deep pool and most visitors will be happy to spend their time here. The water is always cool and refreshing and there are plenty of large fish swimming in it that are friendly, but please don't try to catch them - you are in a National Park and this is forbidden. The surrounding forest is over 1,000 years old and there is a good chance of seeing wildlife, particularly gibbons (which will certainly be heard, if not seen) and many rare species of bird-life. The falls can be visited at any time of the year, but will be in their prime during and just after the rainy season, between July-November. At all times of year, it is wise to be careful of slippery stones, although the path to the third level is well taken care of and relatively safe. Higher up can get dangerous. National Park fees The fee for entering a National Park in Thailand is now 400 baht after being raised in 2006 from 200, this only applies to foreigners and not Thai nationals who are admitted for 10 percent of this fee. If you can prove that you are resident in the Kingdom by having a work permit or Thai drivers license you can often enter for the local price of 20 or 40 baht however you may have to negotiate in Thai for this at some parks. 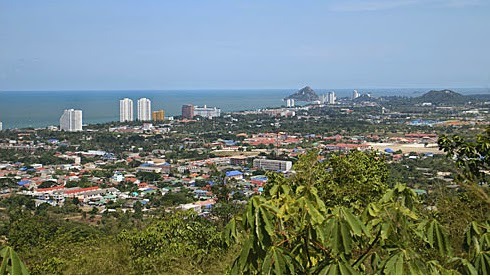 If you're looking for some spectacular views of Hua Hin, you need search no further than Khao Hin Lek Fai (Flintstone Hill). It is situated about 3km west of the town centre. Follow Chomsin Road over the railway line and instead of bearing right with the road to Pala U, keep going straight ahead. It's a steep climb to the top, but worth it once you're there. There are 3-4 lookout spots and it's a popular location with locals, especially at sundown which is arguably the best time to go. Try all the lookouts as they offer views in different directions, you can see as far south as Khao Takiab and beyond and north towards Cha-am. If you're feeling fit you can join the active crowd who make the daily trip to the top by running or cycling however it is not for the feint hearted! There are a few stalls selling food and drink and a bird centre that never seems to have many birds aside from the peacocks roaming around. A well laid out garden with many different species of shrubs, trees and bamboo, together with a statue of King Rama VII adds to the ambience of the location. Unlike any other elephant ride in Hua Hin, you will get to cross the river. The experience is unique to Hua Hin Safari only. Its truly an elephant trek and not just run of the mill elephant ride. You will get to see Thai Village life and a scenic view of Hua Hin. This elephant trek around the jungle and mountains is truly relaxing. The pineapple farm is simply a delight for pineapple lovers Apart from this you will also get to sample the traditional Thai handicrafts. Overall this elephant trek is bound to make you feel like a king! 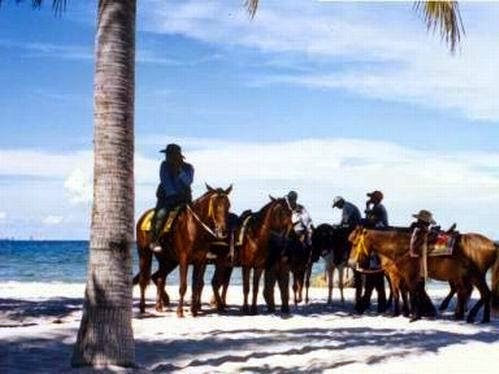 Riding horse on beach can be an interesting activity for anyone. Sometimes when you just hang out on beach all day, instead of enjoying the seaview for long hours, some horses walking by can be an enjoyable moment. Visitor can ride horse or just take photos with the horses. Hua Hin beach is long, some visitors like to do sightseeing all the distance of beach and tend to be to lazy to walk, they take a horse ride instead. Normaly you see the horses just slowly walking by while taking visitors along the beach. A little known animal park lies around 10km north of Hua Hin. It appears to be setup as a government funded "deer research center" so there are no English languagesigns to or in the place. Take Soi Huay Sai about a kilometer after Palm Hills on the left heading north and then it's on the right around 4km down this soi. Entrance is free. The complex has a number of large deer enclosures and plenty of birds, many of which are roaming around the area. Monkeys are also plentiful with macaques, langurs and gibbons, some caged some free roaming. A canal system separates a couple of islands where gibbons also live. The only disappointment is the rather small cages for the Malayan Sun Bear and Asiatic Black Bear, they really should have a bigger pen. 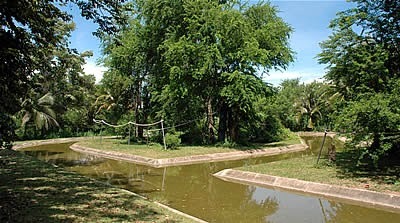 Other enclosures had tropical birds, tortoises, reptiles and porcupines. There is a nice little spot down by the canals where you can sit or have a picnic but remember to bring your own supplies as there are no shops in the park. This is a palace of the Royal Family found a few km north of HH. Built in the 1920s by King Rama VI, it is an open-concept teak wood structure that is connected by numerous raised and covered walkways that are polished to a shine. Walk around this palace's breezy raised walkways with its great view of the ocean and you can't help but feel relaxed. You can buy some food at the Hua Hin market and have a picnic on the grounds here by the sea. Admission is free. Go Kart Hua Hin pronounces itself as one of the best Go Kart tracks in Thailand. Upon visiting the site and safely doing almost 40 thrilling laps at 80 kilometers an hour, we have to hand it to their statement of confidence. Go-Karting on this sole world-class track of Hua Hin would highly deserve an official status as the town’s must-do if there were one. At the first sight, what lies ahead on Go Kart Hua Hin’s 700-meter circuit may be different in the eyes of non-mileage drivers and experienced Karters. Getting the sight of the track’s above-standard scale, true Go-Kart fans can’t wait to get their hands on the steering wheels. Meanwhile, it is comprehensible for newcomers to perceive what awaits them as an arduous escapade. Yet, no matter how the first impressions split, what they share in the end is the incomparable Go-Karting experience. It is located on the new Hua Hin Market Village on the third floor. For a relaxing evening full of family fun nothing bits the challenge of a game or two. Location: Hua Hin Market.